Everything you need to create a fully functional, rubber band-powered, cardboard pinball machine. Unplug from your electronics and get ready to have some wildly inventive fun. This kit comes with everything you need to create a fully functional, rubber band-powered, cardboard pinball machine. In about an hour, and with no tools required, anyone (age 13 and up) will be able to assemble their own basic game. But then the real fun begins, as they use their own creativity to customize their creation, decorating it and adding ramps or obstacles. Any kid or game-loving grown-up will feel like a high score winner as they get to play and show off their one-of-a-kind arcade invention. Designed by Ben t. Matchstick and Pete Talbot in Burlington, Vermont. Made using reworked cardboard from shipping packages in Philadelphia. The dynamic duo of Ben T. Matchstick and Pete Talbot has the power to create magic out of almost anything. As conceptual artists and entertainers, their projects include cardboard sculptures, spectacular interactive puppet shows, Japanese-style street performance, comic books, music, and more. Such wild creativity is best when shared, so the two are also dedicated educators, collaborating with after-school programs and maker communities. 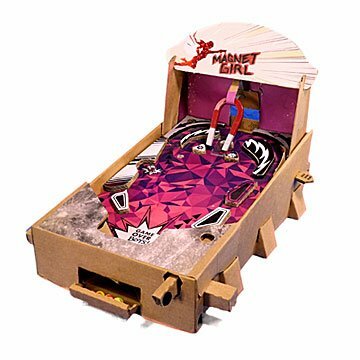 With their DIY pinball machine kit, they bring both their jubilant aesthetic and their love of hands-on learning to the world of product development. Keep dry and clean gently. Keep away from flames. This is the perfect everyday gift for any aged kid who likes games that involve construction. I had to help my 6 year old, but my 10 year old was fine with the instructions, and they play it all the time. Kids who've come over want to play it, too. The first thing I thought after my daughter and I assembled this creation was "whoa this is so smart." We've enjoyed learning together and creating our own world of pinball. Endless ways to create games and scoring methods.